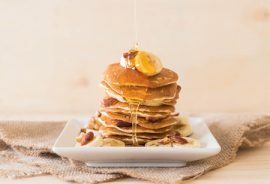 This recipe is specifically for pancake lovers out there who only have so much cash they can spare for IHOP, and it is a recipe to hold on to for years to come! Bringing together the perfect flavor combo of banana and peanut butter—and made all the better with Manuka honey—these pancakes stand alone when it comes fulfilling breakfasts that last all day. So, if you think you want to try making these peanut butter pancakes, let’s get started! This recipe yields about ten servings. To begin making peanut butter pancakes, combine the 1/3 cup of Manuka honey and peanut butter in a small bowl, mixing well before setting to the side. Note: Feel free to substitute peanut butter with soy nut butter for your spread if you prefer. Next, combine the oats, the buttermilk, and the rest of the honey in a medium-sized bowl, mixing well before letting it stand for about ten minutes. Combine the flour, the salt, the baking soda, and the baking powder in a separate, larger bowl. Lightly beat an egg before adding it and the vegetable oil to the oats mixture, blending well. Then, add the oats mixture to the dry ingredients in one shot, stirring with a fork or mixing spoon just until the dry ingredients have become moistened. Avoid overmixing. Heat up a skillet over a medium-hot burner and then grease it lightly. For every pancake, drop about a 1/4 cup of batter onto the hot skillet, spreading it into a 4-inch circle. Flip the pancakes when the edges are bubbling and starting to appear cooked. Note: These pancakes are thick and therefore take more time to cook compared to traditional pancakes. For serving, set one pancake onto a plate, spread 2 tablespoons of the Manuka honey/peanut butter mixture, and then top with between four and six slices of banana. Repeat with the remaining pancakes if so desired. Note: Any pancakes left over should be stored in the freezer for no more than one month. Let them cool entirely, and then stack cakes with wax paper in between. Transfer to an airtight container or freezer bag and seal. For reheats, set two pancakes on a microwave-safe plate, heating at 50 percent heat until the cakes are heated through. The peanut butter/honey spread should be covered and stored at room temperature for no more than three days.